Sorry there's no number. It wasn't obtainable as it now restricted to calling the stores chosen taxi firm. +442085349341, 1st Floor, Westfield Shopping Centre, Stratford, London. Phone did not ring loud but might get someone's attention of a busy weekend. 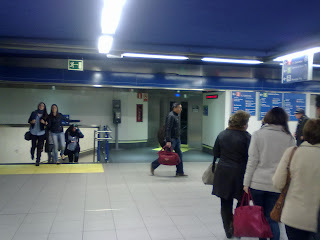 Here is another public payphone in Madrid, Spain. As usual, this one rings LOUD and the audio works OK both ways. Located near Madrid-Chamartin train station entrance seen here on this Google Maps page. Many thanks to Santiago for this fine contribution.